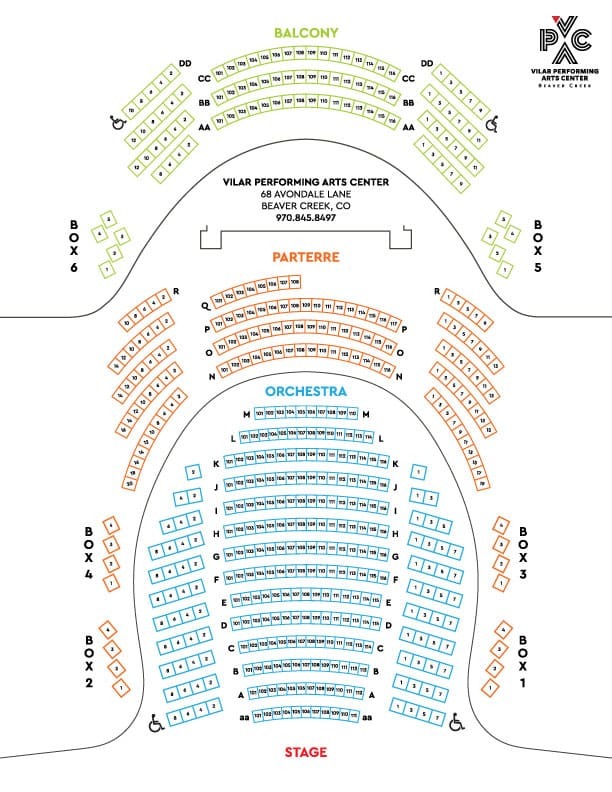 Located in the heart of Colorado’s Beaver Creek Resort, the Vilar Performing Arts Center is a 535-seat theater, owned and operated by the Vail Valley Foundation, which presents a variety of year-round performances including Broadway musicals, concerts, family entertainment, comedy, dance, classical music and more. The intimate and inviting performance space of the VPAC was designed to exacting specifications to create perfect acoustics and unobstructed views from every seat. Box Office Hours are Monday – Friday (11am – 5pm), and two hours prior to curtain on weekends. The Box Office remains open through intermission. Beaver Creek Resort, home to the Vilar Performing Arts Center is conveniently located adjacent to Interstate-70 in the heart of the Colorado Rocky Mountains. Eagle County Airport (EGE) is located just 30 minutes to the west while Denver International Airport (DIA) resides two hours to the east via Interstate-70. Both airports offer services from most major rental car agencies. Take Exit 167 off I-70 at Avon (7 miles west of Vail). Go south straight through Avon’s 3 ’roundabouts’ to Beaver Creek Ski Resort. The Welcome Gate at the main entrance to Beaver Creek will instruct you on parking. Follow Village Road 2 miles and turn left, following signage for the Vilar Performing Arts Center, onto Avondale Lane just before Beaver Creek Lodge. Follow Avondale Lane about 3 city blocks, the VPAC will be on the right and the Villa Montane parking structure on the left. Visit our Box Office located below the ice rink, 68 Avondale Lane, in Beaver Creek Resort. In the event of a show cancellation or date change, tickets are exchangeable or refundable. Please call or visit the Box Office if you are a ticket holder of a cancelled or changed performance. In consideration of all theatre-goers, please arrive in plenty of time to park and arrive in time for the scheduled curtain. Doors to the lobby areas open 45 minutes before curtain. Late arrivals will be seated at the back of the house or in the balcony at the discretion of the house manager. As a courtesy to other audience members, pleases exercise discretion in bringing children to an evening performance. Regardless of age, any child attending should be able to sit quietly through a performance. Children age 2 and up are required to have a ticket for any performance. Lap seats are acceptable for children under age 2, as long as they will not disturb others around you. Cameras, recording devices, and backpacks are not allowed in the theatre. The taking of photos during a performance violates our contract with many artists. In addition it can distract them and negatively affect the show. The VPAC and the areas out front of the center are non-smoking areas. Smoking (of any kind) is not allowed in public areas within the VPAC. We make theatre for everyone and everyone can attend our theatre. Ramps and elevators are available for ease of access; see an usher upon arrival. Wheelchair accessible parking is located in the Post Montane lot (P2), and curbside drop-off is located at 68 Avondale Lane. Wheelchair and companion seats are available in all price levels. Summer parking is FREE in Beaver Creek on a first come, first served basis. The VILLA MONTANE lot is directly across from the VPAC on Avondale Lane and the FORD HALL lot is located just north of the venue on Village Road. Travel between your Vail hotel or residence easily and inexpensively. Enjoy discounted VPAC rates starting at $15/person round trip (driver gratuity not included). Must be booked through the VPAC Box Office a minimum of 24 hours in advance of performance date. Park, walk or Eco bus to the lower Beaver Creek Village lots (Elk and Bear) and hop on the complimentary transportation Beaver Creek Village shuttle which runs every 10 – 20 minutes during the winter season. Please refer to this website for all information on the current Beaver Creek shuttle schedule. Additionally, many of Beaver Creek’s local lodges including The Beaver Creek Lodge, Park Hyatt Beaver Creek and The Charter Beaver Creek will offer free valet parking when you dine at their restaurants, all of which are just a short walk to the VPAC.